Tagging allows you to quickly filter your mail, contacts, tasks, and documents according to your own parameters. 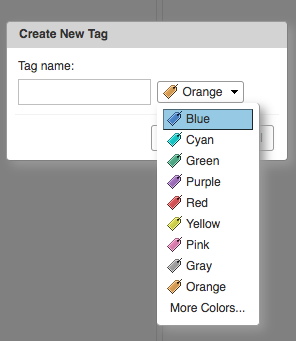 You can create up to seven different colored tags to help you organize your email, contacts, tasks, and documents. 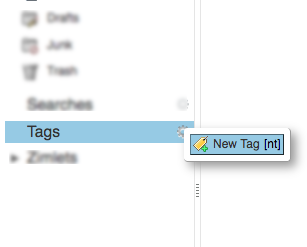 To create a new tag, simply click on the gear icon near the upper-right corner of Tags heading and then click New Tag. Tag Name: This is a description of the tag. Color: Using the pull-down menu, select the color you want associated with this tag. You will now see the named tag you created beneath the Tags section in the left-hand column. To tag an email, simply drag the tag from the Tags section and drop it on the email you would like to tag. You can even tag multiple messages at once. Just drag your selection of messages to the tag in the left-hand column, and the messages will be tagged accordingly. Alternatively, you can tag an email by selecting the tag icon from the mail application toolbar. Tagging is an extremely versatile tool for filtering your email. Once you have tagged a message or messages, you can filter to see only those tagged messages by clicking on the corresponding tag(s) under the Tags heading. This will show all messages you have tagged throughout all folders. You can even assign multiple tags to the same item! For example, you may wish to create a tag for "Friends" and a contact for "Co-workers." Alternatively, you may wish to create a tag for "High Priority" and "Low Priority." Ultimately, the possibilities of tagging are limitless and can be created to suit virtually any need.